Q. Gaël took a lot of risks today. Is it the main reason of your loss, you think? RAFAEL NADAL: No. He take a lot of risk. I take more risk than him. That's my feeling. I didn't play the right way tactically in the first set, in my opinion. I wanted to play more aggressive than usual, playing more inside, don't wait. So just try to go more for the point than usual, and I think that's because I am trying to do it more than last year. But to play against him is not the right thing, but I really want to do it. So that's why I tried, no? He did well. He played very well. In my opinion, he had fantastic shots with very good backhands, good forehands, his movements was fantastic. So to play against him, I know that I cannot play like I did in the first set. I need to wait a little more. I need to play a little bit, you know, slower and wait my chance. Generally I'm happy, no? The second set, I started doing well, doing what I have to do to win a match against him. I don't think the match was bad for me. I didn't play well the end the match. I was a little bit unlucky in a few decisive movements, my opinion. He did better than me. I congratulate him. He's doing well. He's playing really well. All the best for tomorrow. Q. It's one match, but as we saw new Abu Dhabi, you're gearing up obviously for Australia, as everyone is. What does this loss do for your preparations for Australia? RAFAEL NADAL: Nothing. I go to Australia very happy about what I did here. For sure I would love to win tournament, win today, have another match tomorrow. I am not lying to you, and my feeling is very positive. I think I played great tournament, much better than what I thought. So seriously, the only negative thing of today is to lose. For the rest of the things, I am satisfied. I played more aggressive than usual during all tournament, including today, even if I know that's not the right thing maybe to do it. I tried. I needed to be a little bit more consistent today for moments, but in general, I am doing the things that I have to do to compete against the best players of the world and to try to win at important tournaments. So I happy with almost everything, seriously. Maybe I may not gonna win Australia, but I have to keep working like this and I'm in the right way to win in the future. Q. Can you talk a little bit about the reason why your new racquet is a little bit heavier? And when did you think about that and when did you decide to try this? RAFAEL NADAL: We thought about that after Wimbledon, but I, you know, I was injured. I played all Wimbledon, injury. You are remember in my fourth against Del Potro? I had problems, so I finished the tournament playing with infiltrations every day. So after Wimbledon I had to stop for three weeks. I only was able to practice five days before Montreal, Cincinnati. So I did not have the chance to do it. We wanted to do it after US Open, and we put it a little bit too much weight on the racquet. So I felt that I was ‑‑it was very difficult for me to have the control of the ball, and I had to play Tokyo and Shanghai. So we felt that it was too much, too much risky for those two tournaments. After that, in theory, I had to go to Bercy so I didn't have a lot of time. So we decided to do it at the end of the season. Worse thing is, in theory, we had to practice one month with a new racquet. Finally I get injury on the knees in the final of Davis Cup, and after, on the shoulder. So I wasn't able to play. So we reduce a little bit the weight in the beginning we prepared the racquet. So now we just playing with three more grams on the top of the racquet. But if you put three grams in a different part of racquet, is nothing, but in the top, yes. You feel. We decided to do that, because we believed that with this racquet, can help a little bit with the serve, can help a little bit to hit the ball a little bit longer with less, how to say? We found it to play that aggressive, to play a little bit easier, and to hit the winners sometimes can help me, no? So I need time, but I felt positive things during all this tournament, and, you know, I thought it would be much more difficult than what there is today. So I'm very happy. Q. Just out of curiosity, if there was one player in the history of tennis that you could play against, who would that be? 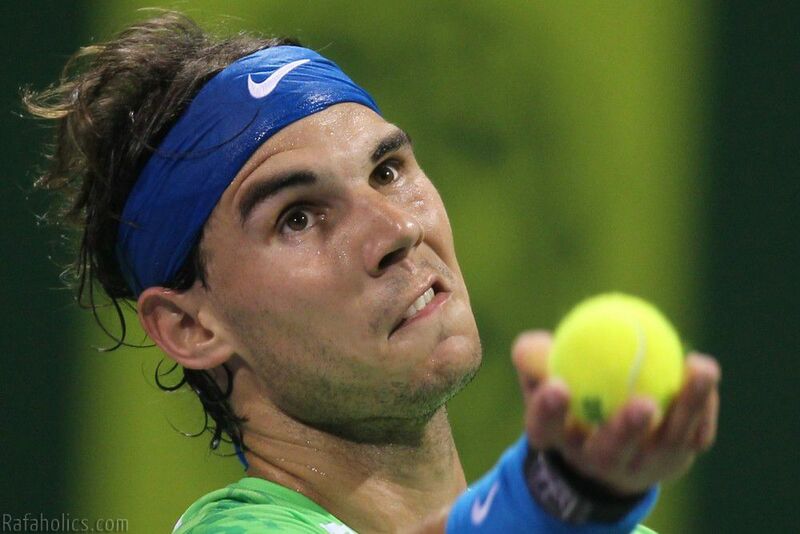 RAFAEL NADAL: I don't know. I don't know. Just fantastic champions in the past, fantastic champions today. I cannot say one. Is a lot of people that I would like to play against. RAFAEL NADAL: Yeah, I think so. To play against him, yes, because he's very fast. He can move the ball. He can move around the court very good. And the court is not very fast, so is very difficult to hit a winner straight, because his movements are fantastic, probably the best on the tour, no? So you have to wait a little bit more, have to be a little bit more patient. I did, at the beginning of the second, trying to hit higher for moments. And when I changed the direction of the ball, good position, no? But playing all the time at the rhythm, at the high rhythm finally, you know, was too much risk for a small profit. I played a lot of times against him. He's playing well. He's improving. Seriously, to play the way that I played today, the first set, you have to be playing really unbelievable to win, playing with a little bit more tactic probably. With less level, you can have more chances, but anyway, he beat me. He played better than me. That's all. Q. Was it a similar match in 2009 against him? RAFAEL NADAL: No. 2009 I get injury on my knees here, you know, against him. So I didn't fight that much as I did today. Today I really wanted to win. I really tried with doing things that I need to improve. I try. Happy about that. Only thing that I'm not happy is I cannot lose two serves in a row in the second set. That's the worst part of the match. That's the end of the match. I can lose one break, yes, but I cannot have two breaks in a row. That cannot happen in the future even if I am playing aggressive. I cannot lose two serves, and I played terrible point with a 4‑3 break point. RAFAEL NADAL: He stopped playing, and, yeah, I lost the concentration, because I don't know when ‑‑seems like he was trying for a challenge, no, at that moment. Finally he continues and I lost the concentration on the point. But, no, the only negative thing is that. Q. You mentioned when he seemed to stop, and then you hit it into the net. As you said, you lost the concentration, but did you feel that continued onward or you were thinking about that moment even after that shot, the last few shots? RAFAEL NADAL: No, he had a very good serve. That's fine. That was a big mistake for me, because with 5‑3 on serve, normal thing is held the serve, and once that ‑‑ well, I feel confident to win the match. No, that's fine. I get unlucky at the first point of the 4‑all, because he returned the ball with not the strings, and I had an easy ball. But the bounces went crazy, so I only had the chance to save the ball to his forehand. He hit a good shot. I hit the volley to the net. I had mistakes from the first ball in the 15‑All, and after that he played very good two points. So another time a bit unlucky, and with 5‑4 with the deuce, fantastic point, I am wrong. I did a mistake, because I went to the net with the ball that I had late. I had to go to the net two balls before, not with that last ball. He played fantastic shot, but I was a mistake. The normal thing is win the point anyway, because I played very well the point and he did fantastic. But playing that point, that well, the normal thing is win the point. So I lost another time the point. A little bit‑‑ you know, the moments that can change the match, I didn't get. Q. He's 16 now. He was up to 7 last year. From what you saw tonight, does he have the potential to go back into the top 10? RAFAEL NADAL: When you are 7th in the past, you have the potential to come back to the top 10, for sure. We'll see. That's just the beginning of the season. We'll see. Gaël has a very positive thing that he can play very well on all the surfaces, and that's very positive today. He has good record in indoor, outdoor, clay, grass. So that's an advantage, because, you know, you have all the parts of the season, positive to add points.